Nepal is located in the Himalayas, bordered to the West, East and South by the Republic of India and to the north by the People’s Republic of China. Although it is not a common vacation destination, the pristine environment is sure to attract a lot of adventure junkies and nature lovers. With Nepal’s rich cultural history and religious influence, one should expect to see a lot of monasteries and temples visited by people from all over the world. In Nepal there are lots of beautiful places to visit. 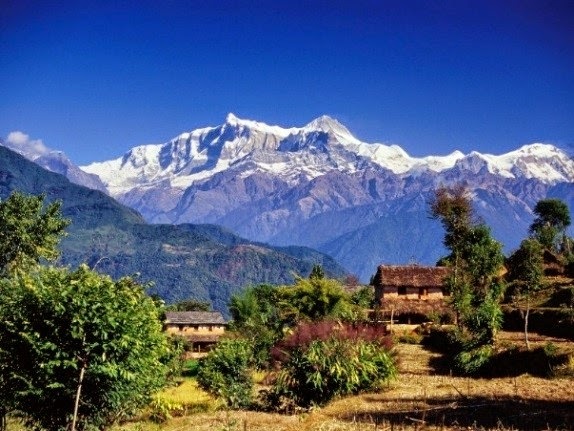 Nepal is of course most famous for its gigantic mountains. Mount Everest, also known in Nepal as Sagarmatha. Earth’s highest Mountain which in Nepal It is located in the Mahalangur part of the Himalaya.it is over 160 million years old. There are two main climbing routes and many others that are less frequently used. Since the first successful ascent in 1953, thousands have climbed to the summit of Mount Everest, hundreds have also died while attempting to do so. Foreign tourists, particularly from Western Europe, the United States and Japan. Home to eight of the highest mountains in the world, the Himalayan nation has been a paradise for adventure seekers offering them ultimate challenges. There is a South Base Camp located at 5364 m (17598 ft.) and a North Base Camp located at 5150 m (16900 ft).Supplies are taken to these base camps and climbers will often stay there while acclimatizing to the high altitude and lower levels of oxygen. Although Mount Everest is the highest mountain on Earth above sea level. As the country emerges from a decade-long civil war between security forces and Maoists, tourism officials here believe it is now time to showcase the country's other cultural riches to the world. Nepal, home to the birthplace of Lord Buddha and a number of the most sacred Hindu sites, wants to attract visitors interested in its rich history and culture. The entire travel trade industry of Nepal is unanimous in the view that Nepal can be considered as one of the world’s brightest spots in tourism growth. But, double digit growth in tourist arrivals will be possible, only if airfare to Nepal come down substantially. To the level of similar popular destinations around the world. More and more countries with tourism potential are realizing that they have to strengthen national flag carriers to increase tourist arrivals. Due to this realization, it is forecast that Asia Pacific Region will have the largest increase in fleet size, increasing at the rate of 300 to 400 additional aircraft per annum in the next 10 years. The economy of the country is in dire straits, with grim hope of growth of any export-oriented industries. The possible earnings from surplus power from ‘tremendous’ potential of hydro-power generation has almost become a mirage only. The quickest, easiest and least investment solution for earning foreign currency is the tourism industry. The sooner our policy-makers realize this, the better it is for fast socio-economic development of the country.